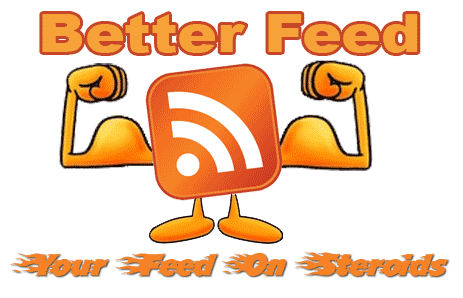 Better Feed is a plugin for WordPress that allows you to enhance your feeds with several highly customizable features. Using a convenient interface with real time preview, Better Feed will allow you to add anything below each entry in your RSS feed. It also brings back the ability to split your feed with "Read More" links, just like your blog posts. On your site, you can split post on two parts, teaser and body, using the tag <!–more–>. Why not have a "Read more" link as well in your feed, for longer posts, or when you want to tease and keep the surprise off the feed ? Concerned with content stealers reproducing your posts automatically somewhere without giving you credit ? Why not add something like "© Joe – 2005" and a link to some neat Creative Commons License ? When you find an interesting post via your feed reader, you often have to check the website for new comments, or to subscribe to the comment feed. Why not add, at the end of every RSS item, something like "13 comments", just like in your blog frontpage ? Why not add a handy link to quickly check who's linking to your post ? Once you're done installing it, head to "Settings" and then "Better Feed". Everything is configured and tested from there. If you include the number of comments in each feed item, be warned that some feed readers will display an item as "New" every time someone comments on it. It's normal, and it is how I intented it to behave so following conversation is easier than ever. If you're using Feedburner, your feed won't immediately show changes after you've activated the plugin. To do so, go to your Feedburner Dashboard → Troubleshootize → Synchronize. Has anyone successfully got this script to work while using Tweetmeme's feed button (the green retweet button) or Topsy's new version of the same? If I turn this script off, the code those plugins send works. When the script is on, it doesn't. This is such a great plugin and I want to keep using it, but I feel I am losing possible retweets from RSS only reader by not having these retweet buttons working. Can Gravatars be added to the feed? Somehow, the Preview and Help button on two of my blogs does not show. Only Editor box is shown. But in source code, Preview and Help are also mentioned. Why they have been removed? Preview feature was really helpful. The only feature I did need was the support for 'read more' tag. It could be nice the ability to add Related Posts, as CopyFeed does. Followed your BAI & SMYF License :) Thanks!! I'm using it on my site ! Sweet plugin, thanks a ton! Alas, I have lied. Sorry for the previous post. Apparently, it's all working now. Must've been something with Feedburner/Google's cache. It was weird 'cause some changes showed up after re-syncing Feedburner, but the categories took much longer — like 6 hours. Anyways, all is swell and thanks for a fantastic addition to WordPress! Thanks for that amazing plugin, i want to ask a question. Is it possible to add header,footer,sidebar part of our site to feeds? I mean let our visitors see the full page as rss feed instead of just the post.Thanks right now..
AlpDmr » That makes no sense at all. Your visitors using your feed want your feed. Yes i know but i've seen many example like that and it allows to site owners for presenting their other goods/pages etc., allows to visitors for exploring other content and it is very useful for preventing content thieving. Is it possible with your plugin? I.ve installed the plugin works great but one question. I can get the post truncated on the website which accepts the feed but the read more button is not a link on the same site, its still points to the whole post the source website. Why I use it without any Effects? Why there is a difference between the editor preview on this site and the plugin editor? The plugin has no preview button and no html button. How can i add the options also to my comment feeds? hello,i have a problem about this.i enable this plugin,it works,but has a problem. If I set up WP to just send out a summary then it only sends the excerpt, and just skips your plugin altogether, which does no good. Is there any way to get the two to work together, so the part above "read more" (in the feed) is the excerpt instead? Any ideas? Carlos » Sure I have an idea. Ok, I see, but I'm not 100% agree and it depends on the blog content. You prefer full feeds but is there any way to make your plugin working with partial feed? Any hack? I have a general question to this great plugin. Have you considered adding an option to output content in both the header and footer of the RSS feed? Hi Ozh. I don't really like to pester plugin authors with questions but seeing as you actively reply here it's probably worth a shot. I have tried to find out a way to get this published on the feeds (ideally at the top of each) but can't find out a way. Does it have to do not being it within the_content()? Am I out of luck? Thanks! Thanks for your great plugins. I use and love several. Can you confirm that this plugin works with 3.01? I installed Better Feed on 2 of my blogs. It works on one, but not on the other. Their other plugins are nearly identical, so I don't think it's a conflict. The main difference is one blog has been upgraded to WP 3.01, while another is still running an older version. Thanks for the confirmation. After some trial and error, I discovered a conflict between Better Feed and YARP (Yet Another Related Post plugin), an older plugin that I was running on just one of my blogs. I chose to keep the Better plugin, of course. Will be sending you a donation as soon as I get my first paid feed ad, scout's honor! It just seemed to keep your plugin from working – could see the related posts in my feed, but nothing from Better Feed. As soon as I deactivate YARPP, BF works perfectly. Further observations on the conflict: When I clicked my rss button and looked at the feedburner feed, YARPP showed up while BF disappeared. This is what I noticed earlier. But in bloglines, BF seems to win. Related posts didn't show up, while BF did. I am using a plugin that links my wordpress to a phpbb forum for my comments. On my pages I inserted a "<?php if" to call from a plugin to show "# of Comments in the Forum" but this does not show up in my rss feed. Can I use "<?php if" code with your plugin? Does this plugin still work or not? It does NOT work for me. I tested the function "wp_ozh_betterfeed"….this function only be called when I read the HTML page…. NOT be called at all when I read the RSS feed…. This function is only be call when I display the HTML page. It is NOT be call when I disply the RSS feed, which means the feed does NOT change at all. Kaman » it does work. Hi Ozh, the problem with YARPP is that if you enable yarpp in the feeds, and you enable "use more tag in feeds" in BF, related posts aren't displayed. Yes…I found the problem too…..
whatever number less than 1200, I choose 1000. Then, YARPP run after BF…..
Have u removed the "Preview" feature of the Better feed plugin? I can c the feed item footer editor but can't preview the footer I edited. Could u please add this feature back? Very new and very lost in WP and all this code. Can I include a post image in this. If yes, how? My feedburner needs sprucing up. Thank you! I would like to display a list of the various taxonomies that each post has been assigned to in the RSS. Is there a way to do this like we can for tags and categories. You are a genius! Thanks so much for this plug-in. I have a love-hate relationship with Feedburner, and this may have saved us. Please check out my site: http://www.dishragdiaries.com! I'll for sure mention this plug-in, and will donate, too. Cheers! Um… I might be losing my mind, but I can't find your donation button, which I JUST saw. Help? I am running a multi-author site (not multi-site). I'd like to be able to put a copyright notice that would automatically change to which author wrote the post in the feed. I already have the site doing this on individual posts, because our authors own their content. Can this plugin do that? Or does it automatically just use the site name or owner for copyright information? So you can have a simple function in your theme's functions.php that would echo the proper copyright, and call that function from within the feed footer. Experiment, break, experiment more, succeed!